Gewiss: a variable-angle elbow can be adapted for every situation on the worksite. even the element is cut, the metal stays protected at its end because of the effect of galvanic coupling. According to Gewiss, this surface treatment offers a resistance four times higher than hot-dip galvanized! Legrand works on its part for integrated connection solutions between cable tray sections and particularly for assembly methods that don’t require any tool. Since 2 years, Panduit has been developing cable management solutions for optic fibers and copper cables for computer rooms from 50 to 100m². The American manufacturer has developed relations with electricians for computer room projects, particularly in the context of energy issues. 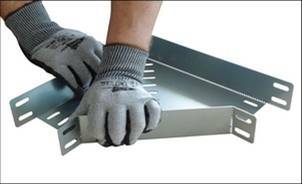 Gewiss: The high protection zinc + aluminium coating of this cable tray offers a strong protection for aggressive atmospheres. 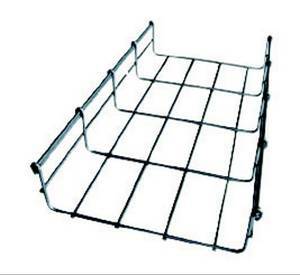 Launched recently, Wyr-Grid is a wire cable tray without edges on top. Only small edges below the tray ensure the rigidity, thus a reduction in the number of cut-outs required for the assembly of elements at the worksite. In order to maintain the cables, it is even possible to add at will side clips to avoid any overflowing. According to Panduit, this concept permits to save until 50% of implementation time. Not to forget the fast fixing of pre-connected cassettes or even derivation accessories respecting the data cable’s bend radius. This wire cable tray brings an added value for optic fiber, knowing it is compatible with Fiber-Runner solution. It can also be used for routing of power cables. An alternative to the threaded rod is the system of suspension by hangers. Adjustable without tools, Gripple Express doesn’t need the small key previously required to adjust the length of the cable: the operation can be made by hand with 2 pushbuttons arranged at each end. Besides, Gripple has recently launched an alternative to the profile standard 41x41mm: catenary kits assume the role of the primary structure for the support of cable trays (or other M&E services). or copy this trackback: http://engineering.electrical-equipment.org/electrical-distribution/cable-trays-even-faster-to-install.html/trackback from your own site. If perhaps you wish to secure more benefits, choose high quality solar panels. camcorders. edu and SUNY ESF, Syracuse, NY New York, Contact: Contact them for specific information on the courses they offer. enough that local homeowners can build them without help. Missed something? Here are October main subjects.